If you lead a sedentary life you risk building up large amounts of visceral fat in your body. Visceral fat is located deep inside the abdominal cavity surrounding the vital organs. The more visceral fat you carry around, the higher are the chances of developing insulin resistance (leading to type 2 diabetes), heart disease and other factors of metabolic syndrome. 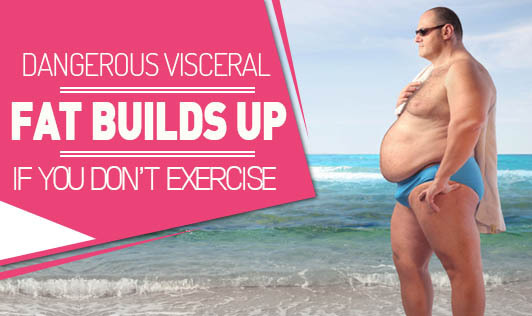 The good news is that exercise can significantly reduce the amount of visceral fat that you carry. The more exercise you do, the more of this type of dangerous fat you will lose. Researchers in a study found that extra exercise can reverse the amount you have, while some moderate exercise can stop your visceral fat mounting up. Take to regular exercises such as brisk walking, jogging, swimming, cycling or any other sport to stay healthy.